Reminder: Wesabe’s Accounts tab and all related personal finance tools will be SHUT DOWN PERMANENTLY at 10:00pm Pacific TODAY. You can download all of your Wesabe data from the snapshot page, until 10:00pm Pacific tonight. After that, all customer data and all stored credentials will be destroyed. We have open-sourced many parts of the Wesabe system (under the Apache 2.0 License), now available on GitHub. Start here if you want to set up your own copy of Wesabe (warning: not for the faint of heart). More information about Open Wesabe is in this Groups thread. If you download a snapshot (above), Open Wesabe will import it, so you can keep using and updating your data. The Wesabe site will be down intermittently from 11:00p to 2:00a Pacific time this evening, as we perform maintenance on our network. Everything should be back to normal after that. Thanks for your patience. File your taxes with your iPhone? 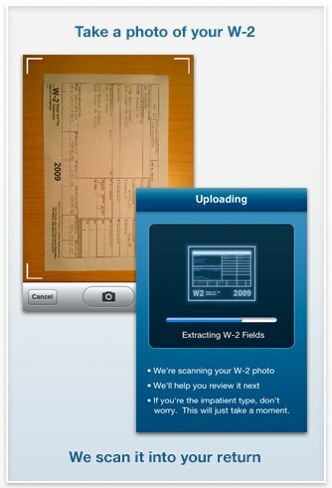 I hadn’t heard about this — Intuit has released an iPhone app (awkwardly) named TurboTax SnapTax that lets you take a picture of your W-2 and file your taxes right from your phone, if you would file with a 1040EZ. Impressive. This app isn’t going to work if you have dependents (as one reviewer notes) or if you have anything but the simplest tax filing to do. I also can’t imagine you’re getting optimal tax advice for all situations from such a simple process. But, whatever! If you have a simple tax situation and especially if you might otherwise file late, you’re better off getting your taxes done as easily as possible. USAA‘s iPhone app has a similar function to deposit checks with the iPhone camera, and I use it all the time. Such a great convenience over having to hook up the scanner. Compared with going to an accountant, SnapTax would probably be even more convenient. I haven’t tried the app (my tax situation isn’t simple enough for it), but speaking as a direct competitor of Intuit, I’m impressed with this idea and would love to hear feedback from people who have tried it. Posted in tips | Comments Off on File your taxes with your iPhone? A coffee pot is not an "investment"
Last week, I wrote a post called “Focus on needs, not products,” that talked about a way to save money by thinking differently: focus on what you need your money to do, not a specific product that you want to buy. If you think about your needs rather than products, you can evaluate a broader set of choices and wind up saving a ton. I gave an example of buying a charcoal grill instead of a gas grill I’d been lusting after, and how I saved 90% of the cost by caring more about grilling than a particular type of grill. For our special theme day on coffee, I decided to review the Bonjour Montano French press — not because it’s new (it came out in 2007), but because it was by far the coolest looking commercially sold French press out there. I was digging the brushed stainless steel leaning-tower-of-Pisa look. It makes eight cups of coffee, which was perfect for when I had a pancake birthday party for my dog Malcolm last weekend. At $70, it’s on the high end of the French press market, but think of it as an investment into the overall coolness factor of your kitchen appliance collection. I already own a French press. I’ve had it for over 15 years now and it still works great. Unless I break the glass carafe, it could easily last for decades more. What problem would I solve by buying another one? This one has a cool shape. Um….why do I need to spend money on a cool shape? The post suggests that you think about it as “an investment into the overall coolness factor of your kitchen appliance collection.” What would be my expected return on that “investment”? Yeah, I don’t need to buy this, I thought (quickly). The “need” — morning coffee — is already met by something I own. Save the money for something I need and don’t have. Maybe you don’t already have a French press, and want one. Should you buy this one? Perhaps, if you have people over for breakfast and coffee all the time, and want to impress them with your sense of style. Or, say, if you film a cooking show in your kitchen. 🙂 But otherwise, you should focus on your desire for a morning coffee, and not “the brushed stainless steel leaning-tower-of-Pisa look” that makes this pot “by far the coolest looking commercially sold French press out there.” Cool looks, brushed steel, and resembling Italian architecture will not help make better coffee for you in the morning. So, yeah. While I love the boingers, I hate having fallen into this temptation even for a second, and despise being told that a coffee pot is somehow an “investment.” An investment should make you money. The best way to have money you can actually invest, or save, or use for something you really need, is not to spend it. Removing temptations to spend — unsubscribing, for instance, from blogs that are all about cool new products you can buy — and focusing on your needs instead, is the best way to do that.